Bhaja caves also share the same importance as those of the others in Maharashtra, including the Ajanta, Ellora and Elephanta. These are, believed to be built during the Mauryan rules, in the early Theravadin phase of Buddhism. 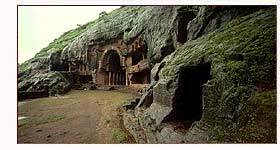 Bhaja Caves are one of the popular Buddhist caves in India located at a distance of 12 km from Lonavla, in Pune district of Maharashtra. These caves represent Lord Buddha in a symbolic form, whereas others have been representing the events that took place in His Life. The caves, 18 in number, are beautifully sculptured with many images of different postures of Buddha, some animals and situations of some stories of the tales of Buddhism. Cave 12th is a prayer hall, worth a watch, and represents a fantastic example of ancient Buddhist architecture. It's the biggest of all the caves, and the tilted vault is worth a interesting notice. The last cave is also a must see, due to the "Dancing couple" structure. As usual with cave culture, there are many Viharas in Bhaja also, which, most probably, served as hostels for the learning Buddhist monks. 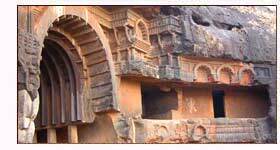 The caves are also interesting for the fact that they are one of the oldest among all caves in India. There are stupas, a common feature to all the caves, also adds to the fact that these caves, at different places, were motivated by the same motifs. Air - Pune is the nearest airport at a distance of around 60-km from the Bhaja caves, while one can also opt for the Mumbai international / domestic airports. Rail - Malavil is the nearest railway station, at a distance of 3-km from the Bhaja village. Malavil is also the first stoppage in the Lonavla, Pune railway route. Road - The caves could be reached easily from Lonavla, which is 11 km from the caves.